Ownership of a luxury yacht is synonymous of unrivaled wealth, a status symbol and floating extravagance that only the worlds richest can possibly afford. They first began to appear at the beginning of the 20th century when wealthy individuals started to commission the construction of large private yachts for their own personal pleasure. Some of the earliest examples include the Christina O and the Savarona with a massive growth in popularity of luxury yachts taking place between 1997 and 2008. So, what originally started out as a fairly simple vessel with basic accommodation has quickly evolved into specimens incorporating features comprising the height of sophistication and luxury as demonstrated with the following top 10 most expensive luxury yachts in the world. 10- LADY MOURA – $210 million Featuring the 10th most expensive yacht in the world is the Lady Moura, custom built by Blohm + Voss shipyards in 1990 for Saudi Arabian businessman Nasser Al-Rashid. This luxury liner is mostly recognisable from the outside owing to its name on the yacht exterior in prominent 24-carat gold lettering. The extravagance doesn’t end there. On board the 344-foot Lady Moura is a pool with retractable roof, a helicopter and a 75-foot Viscount Linley dining room table. However, the Lady Moura’s most remarkable feature is, without a doubt, the unique sand-covered hydraulic platform that slides out of one side of the yacht which can be adjusted to sit right at the waterline. Not only does this floating oasis boast real sand and deck chairs, but also palm trees for a truly authentic experience. The Lady Moura also features a Mangusta 80 boat or 48-feet Sant Juan boat, as well as a S76B helicopter. Finally, the yacht is capable of accommodating up to 30 guests and carrying 60 crew members. 9- AL MIRQAB – $250 million The Al Mirqab was built by Peters Schiffbau Wewelsfleth of Germany for Quatar’s Prime Minister and Foreign Minister Hamad bin Jassim bin Jaber Al Thani. It comprises one of the worlds largest and was dubbed the second most beautiful yacht in the world after it was completed in 2008. On board this luxury liner are ten suites, which can accommodate up to 24 guests, each with an accompanying bathroom, living room and double bedroom. The fortunate owner has two VIP rooms for himself and there are 55 rooms to house the members of crew. Highlights of the Al Mirqab super yacht include the on-board cinema, sun deck, pool and helipad, as well as outside bars, swimming pool, jacuzzi and a range of water sports equipment. 8- DILBAR – $256 million The Dilbar Super yacht, built in 2008 by Lürssen Yachts, belongs to Russian oligarch Alisher Usmanov. It was named after his mother and boasts one of the world’s largest boats measuring 360.89 feet long in total. It is frequently used by its billionaire owner to visit his private islands. The Dilbar boasts some swimming pools and a helipad, amongst many other luxury features, with enough space on deck to accommodate 20 guests and a crew of 48. 7- AL SAID – $300 million Lürssen Yachts is behind this luxury private yacht belonging to, and named after, Qaboos Bin Said Al Said, the Sultan of Orman. Little is known about the Al Said apart from the fact that it houses a concert hall big enough to accommodate a 50-piece orchestra. At the time of its construction in 2007 and 2008, it comprised the world’s second largest yacht and can host up to 70 guests with a crew of 154. 6- SUPER YACHT A – $323 million there is nothing unique about the name of this luxury liner however, the 400-feet long Super yacht A does boast an original design. Reminiscent of a stealth warship or submarine, it was designed by Blohm + Voss of Hamburg and named after the first initials of the fortunate owners, Andrey and Aleksandra Melnichenko, the Russian billionaire and his wife. 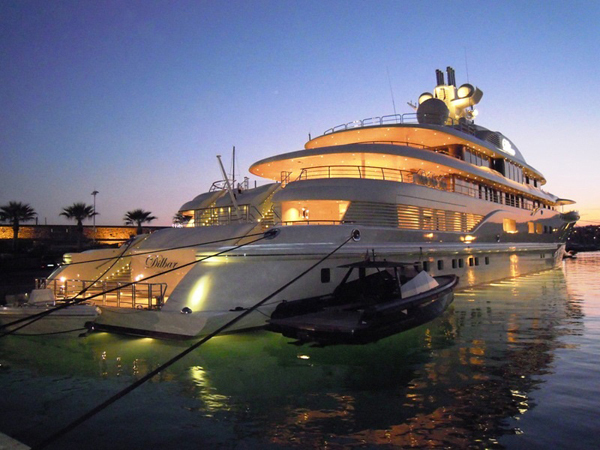 As can be expected, the Super yacht A comprises the epitome of luxury. The boat interior extends over 24,000 square feet housing a 2,500 square feet master bedroom and disco, as well as six guest suites which can be converted into four larger staterooms thanks to the moving walls. In addition, mirrored surfaces feature extensively throughout the interior whilst the furniture, glassware and tableware are made of French crystal. Above deck, the Super yacht A houses a helicopter hangar, as well as a 30 foot speed boat kept in the hull and three swimming pools, one of which is glass.-bottomed and situated directly above the aforementioned disco. Finally, it has been designed to accommodate up to 14 guests and boasts enough space for 42 crew members. 5- DUBAI – $350 million Originally a joint project between Blohm + Voss and Lürssen shipyards, the Dubai was commissioned by Prince Jefri Bolkiah of Brunei more than 10 years prior to the ship’s launch in 2006. It was acquired by Platinum Yachts for His Highness Sheik Mohammed Rashid al-Maktoum (ruler of Dubai) who designed the decadent interior. The most striking features of this beautiful boat comprise the abundance of sunbathing areas, several jacuzzis and the swimming pool boasting elaborate handmade tiling. Similarly, the interior features intricately designed handmade mosaics and a stunning circular staircase with glass steps with change colour with the light that enters from the top deck. Bold colours dominate the spectacularly decorated interior whilst the spacious deck of the Dubai houses a split-level owner’s deck, a large social area and lounge, numerous VIP and guest suites, and finally a crew area large enough to carry up to 115 people. Finally, a helipad, which can accommodate a helicopter of up to 9,5 tons, completes this extravagant ensemble, previously the largest yacht in the world. 4- AZZAM – $650 million Lürssen Yachts is behind this luxury liner which was recently delivered to fortunate Sheikh Khalifa bin Zayed al-Nayan, President of the United Arab Emirates and Emir of Abu Dhabi for no less than $650 million. This makes it the world’s fourth most expensive luxury yacht with the makers boasting that the Azzam is “the most complex and challenging yacht that has ever been built”. However, not only has the Azzam been dominating the headlines for its hefty price tag but also due to its immense size. Measuring in at 590 feet long, this floating extravagance boasts the largest private yacht in the world thus knocking the Eclipse, belonging to Russian billionaire Roman Abramovich, off the top spot. In addition, this impressive super yacht is expected to be one of the fastest reaching speeds of more than 30 knots, or 35mph. The luxury interiors were designed by French interior decorator Christophe Leoni which has been described as “sophisticated and luxurious in a turn of the century Empire style”. For the moment little else is known about the Azzam. Now the only question remaining is, with the world’s billionaires constantly competing to own the largest super yacht, how long will it remain at the top? 3- STREETS OF MONACO – $1.1 billion as the name indicates this luxury yacht comprises a floating replica of the city of Monaco. To be more precise, the Streets of Monaco is modeled on a section of Monte Carlo and expected to cost over $1.1 billion. The reason for such a hefty price tag is that, unlike your more traditional luxury liner, this extraordinary 500-foot super yacht by Yacht Island Design of Derbyshire County in England, features scaled-down reproductions of landmarks from the billionaire playground of Monaco. They include the famous Monte Carlo Casino and racetrack, as well as Hotel de Paris. Cafe de Paris, La Rascasse and the Loews Hotel. Streets of Monaco also boasts swimming pools and tennis courts in addition to sumptuous living quarters imitating those featuring in Monaco’s finest hotels. They include seven guest suites (accommodating up to 16 people) with accompanying receptions rooms, bathrooms, dressing rooms and balconies all located in the Atrium, the ship’s centerpiece. Similarly, the Atrium houses the main apartment of the fortunate billionaire owner, approximately the size of a luxury penthouse, spreading over three floors and extending over 4,800 square feet. Finally, on board the Streets of Monaco there also BBQ facilities, a mini waterfall, a unique café-bar boasting underwater views, helicopters and submarines. The only question that remains is whether they will find a billionaire with enough money to turn this dream boat into a reality! 2- ECLIPSE – $1.5 billion Russian billionaire Roman Abramovich is proud owner of the Eclipse, the second most expensive yacht in the world. Rumored to be worth $800,000 to $1.5 billion, it was built by Blohm and Voss of Hamburg and measures 536 feet long also making it the second largest in the world. The Eclipse’s immense size allows space for the boat’s many extravagant features including 24 guest cabins, two swimming pools, several hot tubs, and a disco hall not to mention the two helicopter pads, three launch boats and mini-submarine capable of submerging up to 50 meters underwater. Furthermore, for maximum security, the Eclipse is fitted with intruder detection systems and a missile defense system whilst the master bedroom and bridge of the yacht features fitted armour plating and bulletproof windows. Finally, this unique vessel boasts an anti-paparazzi shield which consists of lasers sweeping the surrounding areas. Upon detection of possible lurking professional photographers, a light is shone directly upon the camera to prevent a photograph being taken. Finally, a whopping 70 member crew is required to maintain this floating extravagance. 1- HISTORY SUPREME - Price: $4.5 billion finally, boasting the world’s most expensive yacht is the History Supreme. This pricey 100-foot vessel was designed by world-renowned UK luxury designer Stuart Hughes, took over 3 years to complete and was purchased by an anonymous Malaysian businessman for a whopping $4.5 billion dollars! This staggering sum is owed to the solid gold and platinum used to assembly this luxury liner which features no less than 100,000 kg (220,000 Ibs) of these precious metals. They adorn the entirety of the boat right from the base of the vessel, coated in a thin layer of solid gold, to the dining area, deck, rails, staircases and anchor. One of the most outstanding features of this magnificent super yacht is the master bedroom. It boasts a wall feature made from meteorite rock and a statue made from genuine Tyrannosaurus Rex bones! In addition, a 68 kg 24-carat gold Aqua vista Panoramic Wall Aquarium graces the master suite and on board is a liquor bottle featuring an extremely rare 18.5 carat diamond worth $45 million alone! Finally, an iPhone wrapped in 500 cut diamonds, including two interchangeable diamonds fitted over the “home button, a 7.4 carat pink diamond and a rare 8 carat diamond, add to the many extravagant features on the History Supreme, the most expensive yacht in the world.